One of the best annual meteor showers will peak in the pre-dawn hours Tuesday, and for some skywatchers the show could be quite impressive. The best seats are in Asia, but North American observers should be treated to an above average performance of the Leonid meteor shower, weather permitting. The trick for all observers is to head outside in the wee hours of the morning – between 1 a.m. and dawn – regardless where you live. The Leonids put on a solid show every year, if skies are clear and moonlight does not interfere. This year the moon is near its new phase, and not a factor. For anyone in the Northern Hemisphere with dark skies, away from urban and suburban lighting, the show should be worth getting up early to see. "We're predicting 20 to 30 meteors per hour over the Americas, and as many as 200 to 300 per hour over Asia," said Bill Cooke of NASA's Meteoroid Environment Office. Other astronomers who work in the nascent field of meteor shower prediction have put out similar forecasts. Urban dwellers and suburbanites will see far fewer, as the fainter meteors will be drowned out by local lights. The Leonids are created by the comet Tempel-Tuttle, which passes through the inner solar system every 33 years on its orbit around the sun. Each time by, it leaves a new river of debris, mostly bits of ice and rock no bigger than a sand grain but a few the size of a pea or marble. Over time, these cosmic streams spread out, so predicting exactly what will happen is difficult. "We can predict when Earth will cross a debris stream with pretty good accuracy," Cooke said. "The intensity of the display is less certain, though, because we don't know how much debris is in each stream." When Earth plows into the debris, the bits hit the atmosphere and vaporize, creating sometimes dramatic streaks of light and the occasional fireball with a smoky-looking trail that can remain visible for several minutes. The Leonid stream is moving in the opposite direction of Earth, producing impact speeds of 160,000 mph (72 kilometers per second) – higher than many other meteors. "Such speeds tend to produce meteors with hues of white, blue, aquamarine and even green," says Joe Rao, SPACE.com's skywatching columnist. The best viewing will be in rural areas. Get out of town if you can. If you have local lights, scout a location in advance where the lights are blocked by a building, tree or hill. Dress warmly, and take a blanket or lounge chair so you can lie back and scan as much of the sky as possible. "At this time of year, meteor watching can be a long, cold business," Rao reminds people. Leonids can appear anywhere, but if you trace them back, they all point to a hub, or radiant, in the constellation Leo – hence the name. Give your eyes 15 minutes to adjust to the darkness. Then give the show at least a half-hour. The hourly rates stated above typically come in bursts, with lulls that may test your patience. No special equipment is needed. Telescopes and binoculars are of no use because meteors move too quickly. Earth will pass through one of the denser debris streams at around 4 a.m. EST (1 a.m. PST) Tuesday. If you have only an hour or less to watch, center it around this time. Leo will be high in the sky for East Coast skywatchers, putting more meteors into view. In the West, Leo will be low in the eastern sky at this time, so fewer shooting stars will be above the horizon, and therefore Western skywatchers should also try to stick it out until daybreak. Across Europe, the best bet is to watch anytime between 1 a.m. and daybreak local time. The planet will pass through an even denser stream later, just before dawn Wednesday in Indonesia and China, but that show won't be visible from North America because it will be daytime here. 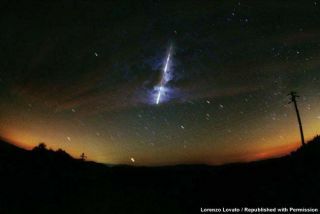 One truth about the Leonids: They always produce, and they sometimes produce spectacular, unforgettable fireballs.